These ESL/EFL worksheets will help learners practice words and sentences used when describing pets. 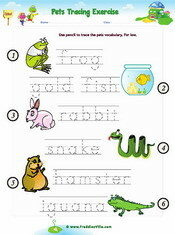 There are spelling, vocabulary and communicative worksheets. This is a communicative worksheet on pets vocabulary. It is great for use in classrooms. Words used include: snake, rabbit, hamster, dog, cat, frog, iguana etc.